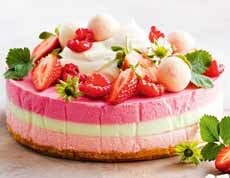 Only ice cream and cake surpass cheesecake on American restaurant menus, says Flavor And The Menu, a magazine and website for restaurant chefs. 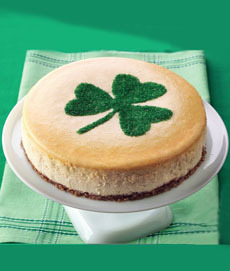 The article points out that plain cheesecake is a blank canvas, waiting for an artistic or flavorful treatment—or both. The next time you plan to bake a conventional cheesecake, consider playing around with these options. You can combine more than one on/in a single cheesecake. Check out photo #4: rainbow cheesecake with a “still life” top. Candy: There’s much to choose from: brittle, candy pieces (butterscotch, fudge bits, baking chips [butterscotch, chocolate, cinnamon, mint, etc. ]), seasonal items like candy corn or Easter egg malt balls, toffee, a swirl of seasonal fruit purée, sugared nuts, trail mix. Just look around the store for inspiration. Cake and cookie pieces: brownie, cookie dough, doughnuts, pound cake, crushed or mini Oreos, shortbread. Forget the gloppy canned cherry or blueberry topping. Use the sauce to spark enhanced flavors. Elevate the conventional: Think salted caramel sauce, Mexican-style chocolate sauce, framboise sauce (raspberry sauce with raspberry liqueur)*. Fruits beyond the can: fruit syrup, coulis, a mosaic of fresh fruits, seasonal fruit purée or a “still life” like photo #4 (fresh berries, meringues, herb sprigs, edible flowers). Ganache or icing, spread or piped (photo #2). Ganache becomes a semi-hard chocolate topping, like chocolate truffles (here’s a recipe). Consider turning the sauce or piped icing into a decorative design such as loops (photo #2) or zigzags. Smooth: Consider crème fraîche, chocolate ganache, icing or whipped cream, plain or flavored. Scattered: Scattered candies add texture and color, such as like chocolate-mint lentils or coffee/mocha lentils or confetti sprinkles. Sparkling: Add some sparkle with edible glitter. Fruits & Flowers: For the most beautiful top, create a “still life” of fruits, meringues, and sprigs of fresh herbs. Crust: Try a brownie or cake crust, or cookies beyond Oreos and grahams. Bottom: Decorate the bottom perimeter with squares of chocolate or other candy. Bottom-plus: The latest rage is rainbow cheesecake (photos #3 and #4). How do you want to present the cheesecake? 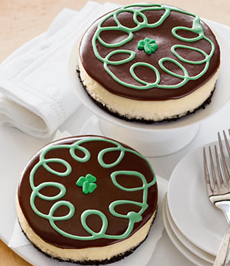 St. Patrick’s design from Kraft, using a stencil and glitter, and  a ganache top with decorative icing, from Harry & David. 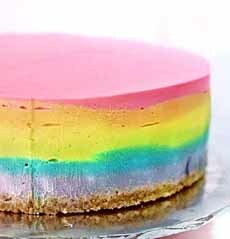 Rainbow cheesecake (here’s the recipe from She Bakes). Rainbow cheesecake with a “still life” top (here’s the recipe from Taste | Australia). Baked in a jar, cake pop, deconstructed, heart shaped, individual mini, layered with cake, mousse, rainbow cheesecake square, trifle. So many variations, so much fun ahead! *You can purchase the sauces and add spices, liquors, etc. to create your flavor.